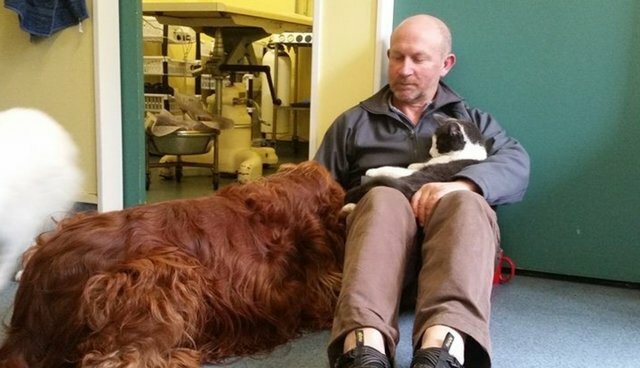 Early yesterday morning, Brett Kirkland was out for a walk with his two Irish setters in Papamoa, New Zealand when he realized that one of the dogs, named Saffron, was suddenly nowhere to be seen. After she failed to reappear hours later, Brett scoured the area and even handed out flyers to his neighbors in hopes that they had seen her, but to no avail. The next morning, as he readied to resume the search for the missing dog, Brett discovered that he was short another pet. His cat Zippy had mysteriously vanished as well. Brett retraced the path he'd taken the morning prior for some clues as to where Saffron had gone 30 hours earlier when he spotted, just a few meters from his fence line, the opening of a deep hole that he'd never noticed before. "I saw a little break in the grass and there was an old septic tank that has reinforced concrete on top and that had fallen through, and I saw the black eye of my cat running around in there," Brett told the New Zealand Herald. Peering closer into the dark space, he soon saw that Zippy was not alone. Sure enough, there was Saffron trapped inside too. With the help of a friend, Brett was able to lower a ladder down into the 10-foot-deep hole and carry his little Zippy to safety, but Saffron proved to heavy to lift alone. He called the local fire department and soon a team was dispatched to lend a hand in getting her out. Fortunately, neither dog nor cat were seriously injured in the fall, or by one another throughout their lengthy ordeal; somehow the pair seemed to have been able to keep the peace over the hours they had been forced to spend in one another's company. In fact, Brett believes Zippy may have been trying to offer Saffron assistance. "I think the cat went there looking for [her]," he said. "When animals go missing, they're often much, much closer than you think."